The primitive fishing methods covered below should be employed in addition to any of your normal fishing strategies and tactics. They are easy to make, require minimum maintenance and possess the potential, if done right, of luring and catching an abundance of fish. Set a control line (hopefully with the paracord you also brought in your kit), and attach it across a narrow, fairly shallow, portion of the river to two opposing trees. From this line, hang down leaders (pre-cut, pre-sized pieces of line with hooks attached to the ends) so that they float a couple inches or so down into the water. The fish swim directly into their path when bait is attached. • The narrowness of the placement will keep fish funneled into the path of the hooks, so you will be able to spread the hooks 8-14 inches apart and have a reasonable expectation of catching fish. • The fact that there is a passivity built into the technique means your time is spent doing other things, and the fish aren’t scared off by your movements in or near the water, or by you looming over them. • The full-time deployment means that it’s just a waiting game until you get something to eat. 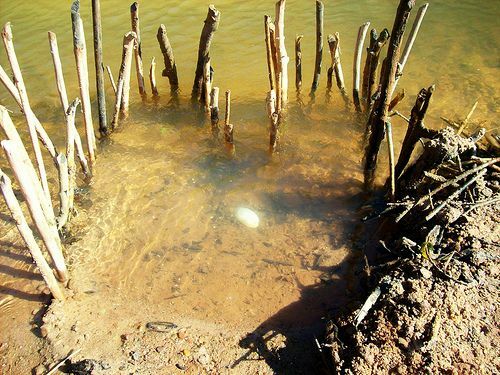 • Turn over a log and find grubs, worms, or even flying bugs to bait your hooks. Anything like that will work, but try to make it as natural as possible. Take three sticks of substantial size (2 inches in diameter will work), and lay them out on the ground about 8-12 inches apart. Weave supple, sapling branches (which are thin), in and out of the three sticks, so that the combination forms a wall of wood with obvious space for water to flow through. The tension caused by the sapling’s flexibility will keep the three sticks in place and, if needed, you can strip thin strips of the bark from young saplings to tie down the different pieces. 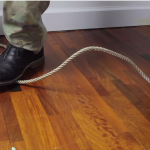 The thin strips can even be combined and braided to create a makeshift cord to use as a low-strength rope. Create enough screens (7-12 of them) to make a substantial fence line in the water. You will anchor these fences by sticking the ends of the three sticks into the sand or mud at the river bottom. • Start on one side of the river at a narrow spot (make sure it’s down current from your baited leader hooks) and cut in perpendicularly for the first screen and then angle the rest so they mimic the flow of the water, until at the other side of the river, you complete the fence by attaching them to that river bank also. • Fish will not know they’re being obstructed as water flow will still be normal (remember it’s flowing in between the sapling branches like a screen). • Fish will be corralled into the far corner of your “fence line,” which can then be closed off and your fish kept alive by leaving them in the water until you need one. Bend the top (skinniest part of the stalk) around to form a letter “P” or a tennis racquet shape and tie the end off onto the long straight part of the “P” where it intersects (somewhere in the middle). Secure the tie off with additional pre-prepared sapling strips or a set of braided strips. If you brought your survival kit, use your para-cord. Now you will tie the leftover ends of your checkerboard design (which should be about 3’x3’ or even up to 5’x5’ in size) to the inside of the circular portion of your “P” design, and lash them securely with a wrapping technique like a baseball bat handle or a tennis racquet handle, where a third of the past wrap is covered by the new wrap. It may end up being a shallow net and it won’t be incredibly strong, but as an aid to grab an escaping fish, it will come in handy and is certainly worth the effort. The loose mesh technique could also be used to create a series of nets that could be used to catch fish. Just loosen the spacing up a bit more to about 1¾” to 2¼”. Allow some more material to gather between each knot instead of making it a straight checkerboard design. If you have the time, which in many survival scenarios you will, you should employ all four methods and your preferred fishing technique at the same time. If the fish you catch using the primitive methods are not big enough to clean and eat, remember that they too are great bait sources for larger fish. To learn more about using primitive fishing strategies in a survival scenario, check out Eco Snippets.